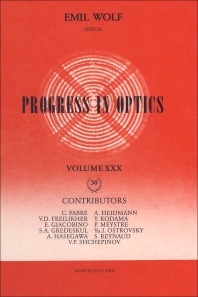 Confirming the fact that optics continues to be a highly active field of research where many interesting developments are currently taking place, the latest volume in this renowned series presents five review articles by well-known experts, on topics of current interest in optics. The first article concerns quantum fluctuations, a phenomenon encountered directly or indirectly in all optical measurements. Such fluctuations set limits to attainable accuracy with which measurements can be made. In recent years theoretical as well as experimental research has demonstrated that limitations arising from quantum fluctuations can sometimes be circumvented to some extent. These developments are of importance from the standpoint of basic physics as well as in connection with technological applications, such as noise reduction in communication systems. The second article deals with correlation holographic interferometry and speckle photography, paying special attention to the effects of random variation of surface microstructure on the contrast of interference fringes. The article which follows covers an important subject in the broad area of wave propagation in random media, namely wave localization. This phenomenon is a subtle manifestation of interference of multiply scattered waves and provides information about important properties of disordered systems. The article considers mainly localization in one-dimensional systems, which elucidate some of the underlying physics. The fourth article discusses an important nonlinear phenomenon, namely soliton propagation in fibres. Solitons are pulses which can propagate over long distances without change in shape. Because of their considerable stability, they are of particular interest for communication systems. The concluding article presents the theory and describes experiments on elementary quantum systems in the context of cavity quantum optics. Such experiments are providing deeper understanding of the interaction of light with matter and give new insights into the foundations of quantum mechanics.